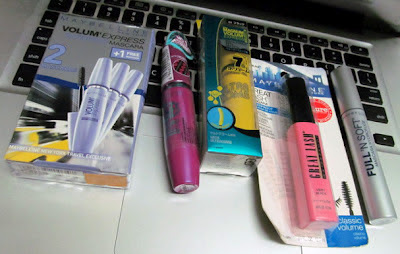 I have always been a huge Maybelline fan, especially the mascaras. Even my first mascara was Maybelline! I remember it was the famous Great Lash mascara, but the normal washable one with the green cap. Over the years, I've tried countless brands, but I've always returned to the brand's items. One of the sad thing is that a lot of these mascaras have been discontinued and very hard to procure. My favorites have gotta be the Great Lash and Full 'N Soft mascaras. The waterproof ones are absolutely fantastic! Nothing can beat them. Sadly they are not sold in Asia anymore. I also use the Volum' Express. They come in many variants too, and in the photo above there's actually 3 variations of the Volum' Express. This is a must-have for my makeup bag! I always look forward to the new mascaras that they release. Not all are suitable for me, but I'm always in search of the HGs on top of my two favorites.